'm feeling very small at the moment. It's late afternoon and the team is below deck at the computers, turning today's adventures into tomorrow's reports. I'm above, on deck alone, with this computer in my lap. A brooding sky arches overhead like a giant dome, touching the horizon in every direction. Between me and that horizon is only the steely gray water of the Pacific Ocean  165,250,000 square kilometers of it, in fact. To be here is at once frightening and exhilarating. There is no feature on earth bigger than this ocean. And nowhere else do you feel so small. The team is en route from Bartolomé to San Cristóbal. There, we'll pick up Jean Michelle Cousteau, Richard Murphy, writer Remar Sutton and the dive pros from Pacific Wilderness. They're coming aboard for our undersea portion of the expedition which starts next week. We're also saying goodbye to two team members: Jack Grove and Jim Dieckman. Jack has been our hard-working photographer, often up before dawn lugging a 50-pound camera case around to get the best pictures. He's also been a great underwater companion. Having written an 863-page book on the subject, he knows every single fish in the Galápagos. I've never seen a human being get more excited at the sight of tiny fish. Several times, we'd be snorkeling and we'd see Jack explode to the surface. "Did you guys see that Microspathodon dorsalis?" he'd exclaim. Or, "Look at that Stegastes acapulcoensis," he'd gargle through his snorkel. 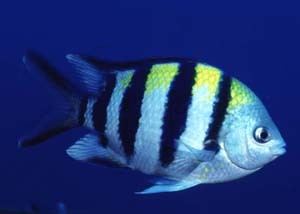 From him I've learned an appreciation of the sea  and 12 Latin names for the Damselfish. We also bid farewell to Jim, one of the two team educators. This is the first time we've invited teachers to join us on our Quests and Jim is the library media teacher at Clearview Charter School in San Diego. Like so many teachers, he is an unsung hero with a modest title. Looking like a taller, somewhat lanky Harrison Ford, Jim is an amateur scientist with a kid's curiosity. He has quietly done much of the behind-the-scenes work, helping us write our reports, choose pictures and collect daily data. Jim is one of those rare souls who is first to volunteer and last to ask for his share. He does as much work as anyone else on the team but avoids taking credit. Several times, I'd mention a topic I'd like to bring up in my updates and an hour later, he'd present me with two pages of research. I never asked for it and he expected no thanks. He'd just do it. I have the great fortune of leading this expedition. On the one hand, I feel lucky for retracing a historic journey through these magical islands. I love being able to share the experience with the rest of the world. On the other hand, the team works longs hours in very close quarters with daily deadlines. We're pushed to our limits; all of our faults start to surface. Both sides of the expedition  pleasant and unpleasant  make this a true journey. It has made fast friends out of Jim, Jack and the rest of the team. And, at least in this case, proved Mark Twain right.